Opening hours: The parliament building is currently closed due to renovation work and there are no more guided tours until approx. end of 2020. Tip: Instead, the guided tours take place in the Hofburg, which houses Parliament for the next time. The Vienna Parliament building (A2/A3) with the Pallas Athene statue at the front is one of the most important splendor building at the Wiener Ringstraße. Built from 1874 to 1883 according the plans of architect Theophil Hansen in the Greek-Roman style the historical rooms are used as residence for the Austrian National and Federal council. Architect Hansen created a total art work and as Greece is know as the cradle of the democracy the Parliament is designed like a temple. A tour through the building brings the visitor back to the ancient Greece. Hansen equipped also the rooms elaborately with self designed furniture, chandeliers and pictures. This building in Vienna is 151 m long, 132 m wide, the construction costs (at that time gulden) would be today approx. 200 million Euro, the biggest of the 1.600 rooms -the pillars hall- sizes approx. 1000 m², an inspection walkway through all the rooms would mean to walk approx. 13 km. If you stay at the front of the parliament the view of the visitor is dominated by a 5,5 m high statue of Pallas Athene which stands in the middle of a large fountain. The sculptor Carl Kundmann created the statue according to the plans from architect Hansen. He was not able to see the finished statue as Hansen was already dead when it was revealed in the year 1902. The goddess of wisdom Pallas Athene holds in her right hand a small figure of Nike the goddess of victory and in her left hand a spear. She is surrounded by personification of the legislation (right side) and the execution (left side) of the laws. Directly at the fountain bowl, which consists of granite, the both main rivers of Austria, Donau and Inn, are represented by a female and male figure. Also the inside of the building is full of history and art. Whether entrance hall, atrium, pillars hall, reception room or the Reichratssitzungs hall which is reserved for special occasions: The history and architecture impresses the visitor. Attention: Until approx. the end of 2020, the Parliament building is closed for renovation work! The premises are only accessible with a guided tour which is offered with different topics (e.g. architecture or everyday life in politics, duration approx. 1 hour, price approx. 5 Euro). The plenary meetings of the National Council are open for public access without charge. The visitor places are located in the guests gallery at the National Council meeting hall. With a valid ID card you get normally a free of charge entrance ticket at the visitor center. 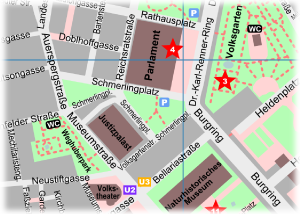 At the ground floor of the Vienna parliament you can find the visitor center. Here you have the possibility to get some information about the members of the Austrian parliament and their tasks by using interactive media stations (free of charge). This is also the starting point for the guided tours and you will find here also a cafe and and souvenir shop. The entrance is behind the statue of Pallas Athene.